Article Provided by Ghost Hunters of the Finger Lakes. Private Residence in the Newark Valley of Upstate New York. We got a call to check out a house in Newark valley in upstate NY. The owner had been having activity and wanted some answers to what was going on in her home. Her husband had even witnessed a large apparition in the basement. He actually walked over to it and swished his hand right through the dark shadow man standing before him. Then the shadow man vaporized right before his eyes. They also had lights flickering, doors closing and opening, and a lot of other noises in their home. After figuring where to set up our equipment and started our investigation, we had a heard a lot of noises and had some really high EMF spikes in the living room. My EMF meter was sitting on the table in the living room and it just started going off for no reason at all. 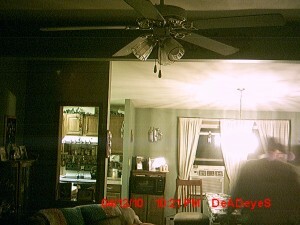 We had many motion lights coming on for no reason and the house seemed to have a lot of paranormal activity happening. We picked up our equipment and headed home. The next day I was looking over my photos taken from the investigation. I could not believe what I had captured in several of my photos in the living room. It was a huge man standing right where we were getting very high EMF readings. The man was huge and it was easy to tell it was not any of our investigators. At first it showed no head, only shoulders and his large body. The next picture showed his head and you could plainly see he was wearing a large hat. We showed the family what we captured along with the high EMF spikes and motion lights going off with no one around them. They could not believe what we captured for evidence in their home. We assured them that it was okay and nothing that could hurt them. They still have activity in their home but they know its okay and not to be afraid of the ghosts among them. They are harmless and never tried to hurt them. Here is my photo of the large man that haunts their home. 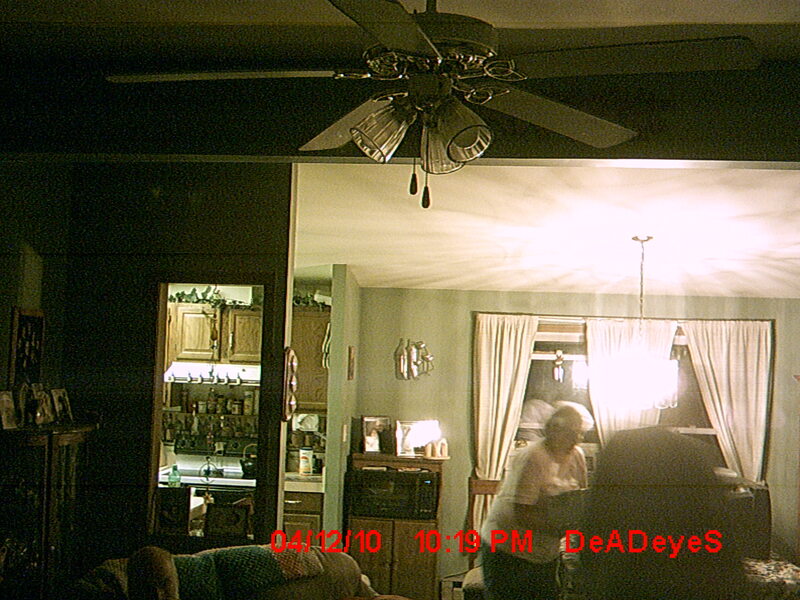 The first picture is my sister walking by the large ghost in the living room. The next one is the large ghost standing by himself in the living room. To learn more about the Ghost Hunters of the Finger Lakes, visit their website.